Virgin Mary Melkite Mission was formed in 1991 under the direction of His Grace, Bishop John Elya. As the families grew in numbers, we were fortunate to move into a small classroom at St. Catherine of Alexandria Roman Catholic Church in Temecula on C street. At that time, with our numbers increasing (now about 50 families), the search was on for a larger facility. In due course His Grace, Bishop John called on Fr. 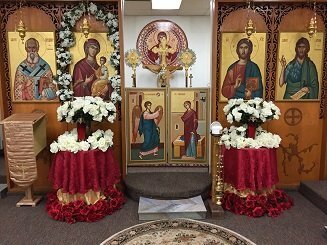 George Bisharat, who was an associate Pastor at St. Anne in North Hollywood, to assist with the celebration of the Divine Liturgy on Sunday for us. Our search for a larger facility brought us to Hillside School where in 1992 we moved into a mobile trailer on the school campus. At that particular location, we were fortunate to have Fr. Charles Aboody assisting us, as well as a temporary priest, Fr. James Atkins who came to us from Ohio. Still we saw the need to find a larger more permanent site for our Mission, so once again we moved to the west side of Interstate 15 off Jefferson street near Old Town Temecula. This move took place in 1993 while we were served by Fr. George El Murr, a priest from Jordan who had been assigned to our mission along with the mission of St. Jacob in San Diego. Our numbers continued to grow. The mission included a carpenter who built our altar table, a Ladies Society that sewed our altar server garments and needed church adornments, and a parish council with 12-15 hard working men and women. Youth and Young Adult groups were formed, comprised of 25-30 teens, under the direction of Deacon Gabriel Ghanoum who also accepted responsibility for religious education programs. Unfortunately for us, we would lose Fr. George El Murr as he was elected Bishop of Jordan. In that interim, we were temporarily assigned once again to Archimandrite Charles Aboody, a retired priest who lived in the area. We then had a permanent priest assigned, Archimandrite Max Chalhoub, who came out of retirement to serve us. Under Fr. Max’s influence, the mission was in the process of searching for property to have a church to call our own. We looked at properties in Wildomar, Hemet (presently St. Teresa of Calcutta), in Murrieta, off Interstate 15, but none met the support of the Diocese. It was disappointing, as we had saved enough money through the hard work of all the families to obtain any one of these properties. Soon His Grace, Bishop John assigned a priest from the village of Mieh Mieh in Lebanon, Fr. Nassir Matta. It was at that time that we purchased a small piece of property with a mobile home on it in Wildomar to provide housing for Fr. Nassir and his family. We remained in the same building in Old Town Temecula until 1996, where we found the need to relocate once again due to exorbitant rent increases. It is at this point, we were invited to share St. Mark Roman Catholic Mission in a rural area of San Marcos to celebrate our liturgy. This move was met with reluctance by some of our Temecula members and surrounding areas where our families mostly lived who now had to drive 25 miles further south. Thanks to a dedicated commitment by many members, we were able to continue our mission there, especially with welcoming Proto Deacon Habib Kasho who relocated from Chicago after his regiment to serve us. However, our community slowly, but surely, started to shrink due to this relocation. When Father Nassir decided to retire after serving us for the past 18 years, we were temporarily served by Fr. Saba Shofany from St. Jacob Community in San Diego, after his reassignment to Utica, NY, we were served by Archimandrite James Babcock. As he also had the responsibility to serve St. Jacob Community in San Diego he called upon Fr. Steven Gross, a Franciscan Friar to assist us. At the urging of some of our old Temecula families, and the need to relocate once again, we made Temecula our home once again. In December of 2014, we moved to our present location on Avenida Al Varado. In due course, newly ordained Fr. Paul Al Khouri Fallouh, a native of Syria, was assigned to serve Virgin Mary Melkite Community. He continues his service, helping our Community to grow, and develop into a vibrant Melkite Parish.